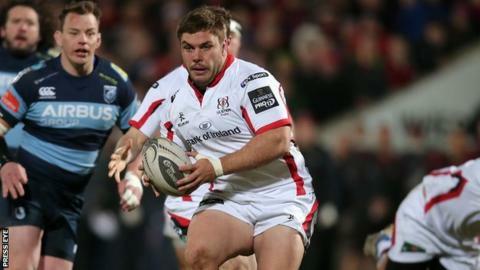 Ulster prop Wiehahn Herbst is set to miss the remainder of the season with a foot injury sustained against Munster. The South African tighthead's injury has not responded to initial treatment. Ulster Head Coach Neil Doak remains hopeful however that lock Franco van der Merwe may be available for Friday's Pro12 semi-final against Glasgow. The second row, who has played in all but one of Ulster's 28 games this season, suffered a suspected ankle injury in the 32-10 defeat by Glasgow. Van der Merwe left Scotstoun on crutches on Saturday following the loss in their final regular game of the Pro12 season, which saw Doak's side finish fourth in the league standings. The Scots finished top of the league, earning crucial home advantage for the play-off tie. Winger Craig Gilroy, winner of the Pro12 try of the season award at the league's annual awards on Sunday night, is expected to be available for selection after nursing a hamstring strain for the past fortnight. It is also hoped that Darren Cave, Jared Payne, Callum Black and Dan Tuohy can overcome knocks in time to play. Ulster are seeking to become the first side to win a Pro12 play-off game away from home. Munster host the Ospreys in the other semi-final on Saturday, with the final taking place at Kingspan Stadium, Belfast, on 30 May.